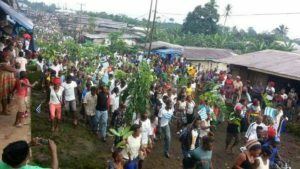 A group of activists have revealed the outlines of a plan to take the Anglophone struggle to the streets of Yaounde. In a memorandum posted on social media and on the group’s website, the activists vowed to “make Yaounde one of the hotspots of the Southern Cameroons struggle” in order to, among other things, force Francophones and diplomatic missions in Cameroon’s capital city to feel the heat of the Southern Cameroons struggle. Calling their plan “Project Storm La République du Cameroun”, the group argues that taking the fight to Francophone Cameroon, especially Yaounde, would help expedite the peaceful resolution of the Southern Cameroons struggle. While the Southern Cameroons struggle is the group’s focus, the activists equally envisage an alliance between Francophones and Anglophones to peacefully bring down the Government in Yaounde, which the group describes as an “evil dictatorship”. Derick Nokwe Etiba, the group’s Coordinator, told The Post in a telephone interview that the activists plan to achieve their objectives through a combination of grassroots mobilisation, street demonstrations and online activism as well as lobbying Governments, human rights groups and international organisations, among other strategies. He said members of his group are Cameroonians fed up with the violence and oppression in the Anglophone part of the country and want to bring the Southern Cameroons struggle to a speedy and peaceful conclusion. While the group supports the Ambazonian Interim Government and other organisations pursuing a peaceful struggle against the Government in Yaounde, Etiba explained that the group is completely independent and does not currently coordinate with any Southern Cameroons liberation organisation. The group did not state in their memorandum exactly when they will start holding protest marches in Yaounde, but Etiba explained that they are still in the mobilisation phase of the project. “We want to move fast because people are dying every day in the Northwest and Southwest Regions,” Etiba said. “But we must ensure that once we descend on to the streets, we have tens of thousands of Anglophones and Francophones singing the same song, each day of the week. Etiba, who is also a member of the Association of Southern Cameroonians in Vienna, predicted that the demonstrations phase of their project will be an unprecedented display of people power in Cameroon.